Students not subject to compulsory school attendance laws who are enrolled for the current school year who do not attend school for ten (10) consecutive days and the local school is not notified of the absence by parent/guardian are considered withdrawn. These students may be dropped from the school’s rolls after attempting to notify the parent or guardian. Students determined to no longer be a resident of the system may be withdrawn even if the student is subject to compulsory school attendance laws. The withdrawal shall be retroactive to the first day of the consecutive absences. Students who have received a short-term suspension (1–10 days), will be allowed to make-up their work; however, it is incumbent upon the student to do so in timely fashion. Students are responsible for making arrangements and completing make-up work within five school days. For currently enrolled students who are subject to compulsory school attendance laws, it is required that schools make a good-faith effort to obtain documented information that the student no longer resides in the school’s attendance zone before the student is withdrawn. Parents/Guardians may be asked for proof of residency at any time. When there is a cause necessitating students to be released from school, they may only be released to their parent(s) or to the person properly identified to school authorities, or upon written notification from the parent(s). Students who have emergencies necessitating their absence from school for a portion of the school day must have been present for the majority of the school day in order to be counted present. Students must attend school for at least the equivalent of half the school day in order to be counted for the whole day. 1. 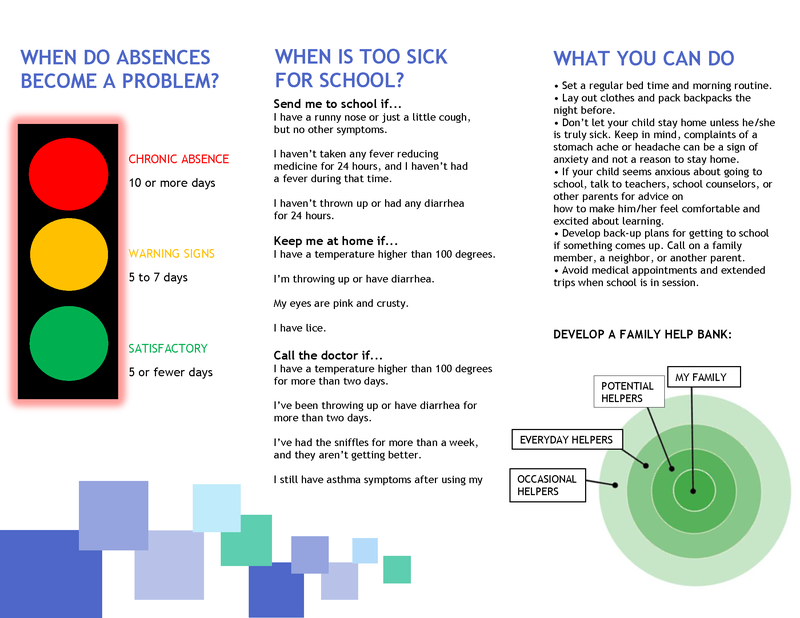 Personal illness or attendance in school endangers a student’s health or the health of others. 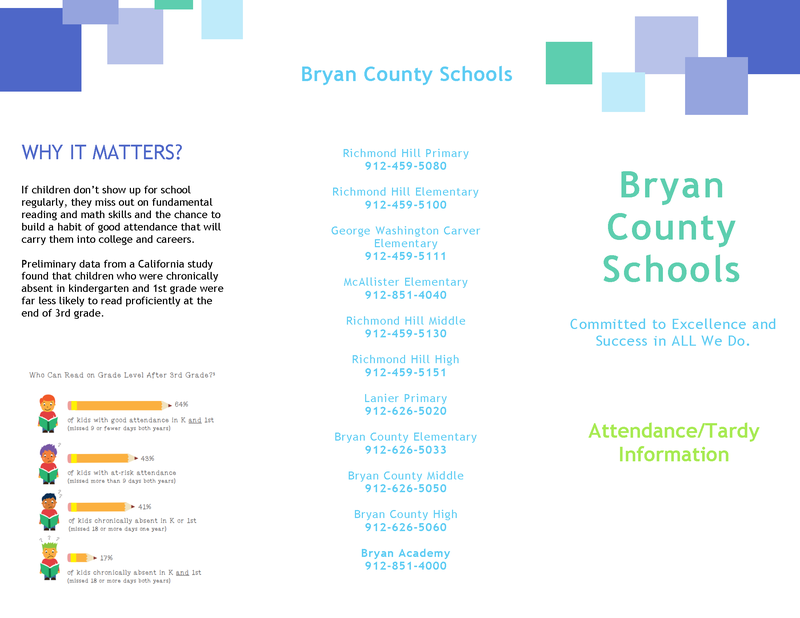 Bryan County Schools will request medical documentation upon the return to school for the purpose of validating that the absence is an excused absence. 2. A serious illness or death in the student’s immediate family necessitating absence from school. In the event of a serious illness in a student’s immediate family, Bryan County Schools will request students to present appropriate medical documentation regarding the family member upon return to school for the purpose of validating that the absence is an excused absence. 3. A court order or an order by a government agency, including pre-induction physical examinations for service in the armed forces, mandating absence from school. 6. A period not to exceed one day (1) is allowed at the discretion of the local school for registering to vote or voting in a public election. 7. Students will be counted present when they are serving as pages of the Georgia General Assembly. 8. Students who are in a foster home or otherwise in the foster care system under the Division of Family and Children Services of the Department of Human Services will be counted present for any day, portion of a day,or days missed from school when attending court proceedings related to that student’s foster care. 9. A student who participates in the Student Teen Election Participant (STEP) program will be counted as present and given full credit for the school day during which he or she served in the STEP program. 10. Military Dependent Absence: Code Section 20-2-692.1 provides that a student whose parent is in the armed forces of the United States military or National Guard, and said parent has been called for overseas deployment or is on leave from overseas deployment, will be granted up to five (5) school days of excused absences per school year to visit with said parent, prior to their deployment or while they are on leave. Parents or guardians are encouraged to contact the school on the day of the student absence to indicate the reason for the absence. Student check-in and check-out procedures are determined at the local school level. A student must have parental permission, however, to leave school grounds. This includes, but is not limited to, local schools requesting appropriate medical documentation from the parent/guardian of a student with excessive absences (excused or unexcused). If a student has accumulated excessive absences, the school will make contact with the parent, guardian, or person having charge or control of the student to notify them of these absences and the possible consequences. School attendance is very important because students must be present to learn. The good work habits they develop now will be beneficial to them later in life. Attendance also correlates strongly with test results. The greater a student’s attendance in class, the more success they will have in school. Student attendance is a specific indicator on the College and Career Ready Performance Index (CCRPI). Student attendance impacts all additional areas of CCRPI as well. Under the laws of Georgia, school attendance is compulsory for all children from age six to sixteen. Students are not counted absent from school if they are present at least half of the instructional day. Students will be marked absent from every class they miss, however, even if counted present for the day. Attendance is checked every period in the high school. If a student is not present for at least half of a class, they are marked absent from that class. Students should make up missed work within five (5) school days. Early Checkouts occur when a student is removed from class and leaves school prior to the official end of the school day with a parent or legal guardian. An early checkout can be marked as excused if it is aligned to the excused absences guidelines. ES/ MS—To be considered in attendance for a school day, the student must be present for at least one-half of the school day, excluding lunch period. HS—High School attendance is taken by class. In order for a student to participate in an extra-curricular activity he/she must be present for at least 2 blocks that school day. Exceptions can only be made by the Principal prior to the school day. At the time the student is released from school, the parent or legal guardian may be required to bring appropriate documentation showing the reason for an early checkout. After any combination of 10 early checkouts and/or tardies, a residency letter will be sent home to verify that the student lives in the district. If residency documents are not produced within 10 school days, then a withdrawal letter will be issued. Tardies for purposes of this section of the student handbook occur when a student is late to school. A tardy can be marked as excused if it is aligned to the excused absences guidelines. Parent/guardian will be notified by a letter sent home of the number of unexcused absences and will be reminded of the state’s attendance requirements. Parent/guardian will be notified by phone. A letter, attendance protocol, and form will be sent home for the parent to sign and return to the school indicating that they received and understand the school’s attendance protocol. A mandatory meeting will be arranged with the parent/ guardian, student, and school’s SARC. Parent/guardian will be sent a letter to inform them that any more unexcused absences will result in a referral to the CHINS Program through the Juvenile Court. The student will be referred to the CHINS Program through the Juvenile Court. Fifteen (15) absences could result in the failure of a class. Parent/guardian will be notified by a letter sent home to inform of the number of unexcused absences and the state’s attendance requirements. A letter, attendance protocol, and form will be sent home for the parent to sign and return to the school indicating they received and understand the school’s attendance protocol. could result in course credit being denied. C.H.I.N.S. is a new approach to dealing with status offences including truancy as created by the Juvenile Justice Reform Act (House Bill 242) and went into effect January 1st, 2014. It promotes early intervention and effective alternatives to low risk offenders and uses juvenile courts as a last resort for discipline. If the school brings a complaint, it must state and show that it had attempted to address the issue at the school level. This includes addressing any disabilities or suspected disabilities that may be contributing to the child’s behavior and/or evaluating the child for special education services, when appropriate. a court order for each day of absence beyond the seven (7) day limit. When a student is ill and sent home by a school administer or a school nurse, the absence is considered excused. Parents/guardians will be notified when the student has accumulated an excessive number of absences. Exceptions to the attendance policy are made only in very unusual situations. In the event of an unusual situation, the parent must submit in writing to the principal a request for appeal of the attendance policy. The principal may, if the situation warrants, schedule a hearing before the school attendance committee. Such appeal must be made within ten (10) days of the end of the semester.